When did Christianity begin to spread? The cross-shaped marble baptistery is one of the new archaeology discoveries at the fourth-century church in Laodicea that shows just how old is Christianity in Turkey. There was already a well-established Christian community here for hundreds of years by the time this magnificent church was built. Photo: Dr. Celal Şimşek/Laodikeia excavation. How old is Christianity? When did it stop being a Jewish sect and become its own religion? As reported in“Crossing the Holy Land” in the September/October 2011 issue of Biblical Archaeology Review, new archaeology discoveries of churches are crucial Biblical archaeology findings that help answer those questions. But when did Christianity begin to build these churches? Early Christian gathering places are difficult to identify because at first Christians met together mostly in private homes. Even as Christian populations grew, distrust and persecution by their Roman rulers forced the early church to stay out of the public eye. The situation changed in 313 A.D. when the emperor Constantine made Christianity a licit religion of the Roman Empire. With this acceptance came the construction of large public buildings, or churches, to serve the worship needs of Christians. Remains of these churches are now turning up in Biblical archaeology findings around the world, helping to answer the questions: How old is Christianity in places like Turkey and Egypt? And when did Christianity begin to spread beyond Israel throughout the Roman Empire? In early February 2011 the Israel Antiquities Authority (IAA) announced some Biblical archaeology findings, including a large Byzantine Church at Horvat Midras southwest of Jerusalem. 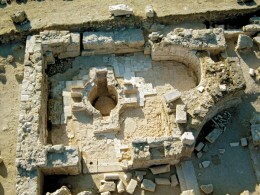 The structure, which was used as a church in the fifth–seventh centuries, was among many new archaeology discoveries at the site and was located inside an earlier Jewish compound. The highlight of the basilica is the mosaic carpeting. The colorful geometric patterns and images of fish, peacocks, lions and foxes are rare in both the level of craftsmanship and the state of preservation. But then disaster struck. Someone attacked these mosaics with a hammer. In the wake of the vandalism, the IAA covered the Biblical archaeology findings, stating that they hoped the mosaics could be mostly preserved, although it will now require significantly more time and money. But how old is Christianity’s presence in Turkey? Given the importance of Asia Minor to the apostle Paul and other early followers of Jesus, it should come as no surprise that a church from the fourth century was among the new archaeology discoveries there. Turkey announced at the end of January 2011 that a large, well-preserved church had been found at Laodicea using ground-penetrating radar. According to the excavation director the church was built during the reign of Constantine (306–337 A.D.) and destroyed by an earthquake in the early seventh century. Laodicea is mentioned several times in the New Testament, in both Paul’s letter to the Colossians and the Book of Revelation. Paul’s letter suggests that Laodicea had a very early Christian community. A bishop’s seat was located at Laodicea very early on, and it remains a titular see of the Roman Catholic Church today, although the city is uninhabited and the bishop’s seat has been vacant since 1968. In 363–364 A.D., clergy from all over Asia Minor convened at the regional Council of Laodicea. It is possible that the newly discovered church is the very same building where Asia Minor’s clergy met to hold the influential Council of Laodicea. Read more about Laodicea in Laodicea Columns Reveal the Grandeur of an Early Christian Center.